We music journalists may be guilty of overusing the word “cinematic” when talking about music, but The Seeker, the new album from Minneapolis band Cloud Cult definitely qualifies with swelling orchestral songs that deal—like most all Cloud Cult albums—with grandiose ideas like the natures of time and love and grief. And if you doubt what any of that has to do with filmmaking, the band puts the argument to rest with the help of director Jeff D. Johnson and actors Josh Radnor and Alex McKenna, who’ve turned frontman Craig Minowa’s music and story into an hour-long, dialogue-free movie, which recently played the Sarasota Film Festival. Shot in rural Wisconsin by Johnson and co-writer/co-cinematographer Chad Amour, the film follows Grace, a young girl growing into a young woman, haunted by tragedy. We see Grace at three different ages, played by Lillia Gray, Josie Axelson and McKenna, but the only words in The Seeker are sung by Minowa, tying in more thematically than directly with what’s on the screen. The combined experience is an undeniably moving one. We spoke with Radnor and Johnson before the Sarasota premiere. Paste: Josh, did you know the guys in Cloud Cult first or were you just a fan? 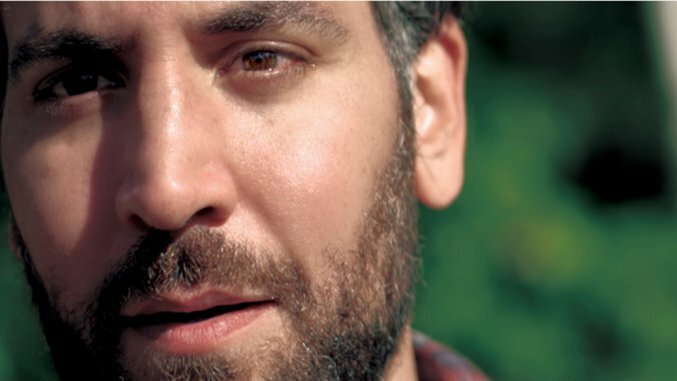 Josh Radnor: I was a fan in a slightly vocal way. I think I did an interview with Entertainment Weekly in the early years of How I Met Your Mother, and I was asked what are you listening to lately. And the first thing I talked about was Cloud Cult because I was crazy about them. I’d just discovered their album Meaning of 8 and I was going into their earlier stuff. Then someone reached out to me and I saw the band when they came to town, and then I just developed a relationship with Craig [Minowa]. We actually talked about collaborating on a film project, because I’d just started working on movies, but it was just one great conversation that never went anywhere. But I’d still come to see shows. I got to know the different members of the band a little bit. But I was in Peru last summer and I just dropped out of this Broadway thing I was supposed to do and I was feeling confused/tender about what to do next. And I got this email from Craig literally hours later that said, “You want to be in a Cloud Cult movie?” And I said, “Yeah—100% I want to be in a Cloud Cult movie.” It just totally lined up with what I wanted to be doing, which was projects that felt aligned with my heart, essentially, just like what feels right to do that’s not about visibility, like yeah, I want to collaborate with my favorite band. I knew Jeff a little bit, but we just went to this beautiful property in Wisconsin on a lake for two weeks and shot this thing with natural light, and it turned out beautifully, and here we are. Paste: Jeff, how’d you get involved in this project? Jeff D. Johnson: I’ve been working with Cloud Cult for about nine years in different capacities, and last three years, I’ve played this production manager, quasi-producer-y role. Like all things, the lines are pretty blurred. And when we were checking out the newest record, Craig felt like there was a storyline emerging. And so he wrote this story out in a very rough way and brought it to me and co-screenwriter Chad [Amour]. We said we think this is a thing. We wrote the screenplay for it, not with the intention of what it ended up being, but it was a collaborative process. Paste: What’s it like being in a movie with no dialogue? Was it challenging in different ways? Radnor: It’s actually a fantastic exercise. I really had to trust Jeff because we’d be talking and he’d be shooting in slow-mo. And I’m like, “Will it look weird if our mouths are moving?” And he’s like, “No.” I know from being a director that sometimes I’d have to hold the vision of sequences in my head because it’s not apparent on set exactly. That’s where you’ve got to be a real leader because everyone’s confused, but you just plow ahead. I asked someone what makes a great film actor, and he said, “It’s when you can tell what someone’s thinking without saying a word.” You can see it in the eyes. It’s just a terrific exercise of being present and being able to tell a story without dialogue, which can be a crutch. I’m a real verbal person and a lot of the characters I write are very verbal. When I saw the movie, I was like, “This is so not a play. This is so cinematic.” You could never stage The Seeker as a play. You could maybe do it as a modern dance piece, but it’s not the theater. It’s properly a movie in the most elemental way. Paste: You’ve used the word “optimistic” when talking about Cloud Cult, but this is a band that formed from tragedy. What is it that grabs you when you have a real sense of loss here? Radnor: I think that loss is the invitation, but transcendence is the promise. I think if they just were just writing about grief and they stopped at grief, they wouldn’t have as many people jumping on the Cloud Cult train. I always say that Craig’s optimism is hard-won. He’s not a polyanna. Johnson: I think the reason it resonates is because it’s extremely grounded. They’ve been through the fire in every sense of the word and have made a choice on the other side of that. We were able to do a four-part web series called Stories from the Road about people that Cloud Cult have met on the road who’ve had terrible things happen to them and the way they came out of that. When you say, “optimism,” it’s more than the sort of hippies with their fingers in the ears saying, “Everything is going to be fine.” It’s an actual active choice. Radnor: It’s not always good. It’s not silver-lining looking. It’s not delusional optimism. It’s saying, “Life is going to throw you some terrible things. Even the most blessed life has tragedy in it.” But they’re saying, “There’s other ways to look at it.” It’s not this earth-bound perspective. It’s actually quite cosmic. And it gives you this enormous perspective of the sweep and scope of time, that we’re part of something so much larger, and if we step into it, there’s some relief from the suffering. There might even be grace on the other side of it. Paste: Do you feel The Seeker captures that feeling? Radnor: If you’re familiar with Cloud Cult’s music, you’ll realize that this movie is completely on brand. [Laughs.] It feels like the next step. When I listen to Craig’s music, it feels so cinematic. The concert is such a great live show. But all the Cloud Cult themes are here in this movie. Johnson: Trying to illustrate that choice, the idea isn’t that her perception is completely in control of all things. It’s that she has a role to play in how things roll out beyond an event. That’s for sure Craig and Connie’s story. That’s most of our stories in either macro or micro ways. That unfolding and the way we respond to events is it. Paste: The fans have had chances to see some of the uncut pieces of this story, but what’s the response been to the movie from the first crowds? Radnor: I have a friend who’s quite a well-known novelist and she was very stuck on her book. She was so grateful because the film just uncorked something within her and she wrote well into the night. I told Jeff that’s the greatest compliment you can get because an artist said, “Your art helped my art.” I have friends who were just struck by the beauty. It’s an incredibly visually arresting piece, and married with the thrilling score from Cloud Cult and the so-so acting from me [laughs]—the other actors are terrific. It’s an hour movie, but it has the wallop of a much larger movie. And something I learned from Boyhood— what’s so moving to see people at different stages through time? That was actual stages through time, but we have an actress who’s eight, thirteen and mid-thirties. It’s emotional to see a big chunk of a life in a movie. Johnson: What’s true for me about a lot of music, but especially true for Cloud Cult’s music, is that it stirs up the thing that’s already in you and calls it out. If this film is able to do that, I’ll sleep well at night. Johnson: It’s the story of Gale Rose, a Memphis resident. Her son passed in a car crash and after he passed, his notebook and bag got thrown from the car, and his notebook was full of all of his poetry. But also mixed in there was “Journey of the Featherless.” And they went back to his room and “Journey of the Featherless” was queued up on his stereo. And there was more writing up there of Cloud Cult stuff. I’m not the kind of man, who’s into looking downward. I’ve drank my share of pity from the bartender’s cup. There are so many people wondering, “What’s the right direction?” As far as I’m concerned, there’s only one way: up. Though my fingers are blisters and my eyes are bullet holes, my heart keeps beating. I guess I’m pretty lucky, pretty lucky, pretty lucky. That feels like a whisper from beyond. It’s so powerful. Some bands I look at and I feel like, there’s something that you’re doing that’s fascinating but I don’t know what it is and how it relates to me. I feel like every piece of art emits a frequency. It’s almost like a dog, whether you can hear it or not, whether you’re attuned to it. For whatever reason, ever since I heard Cloud Cult, I’ve been like, “This is on my frequency. I understand what this is.” It inspires me that I want to make art that is analogous to what they’re doing in my own art. They’re hugely inspiring and to be able to collaborate with them and also to be a vocal fan of theirs and to bring people to their music has been a great gift. Paste: That’s what motivates us in a lot of ways—just to turn people on to things that we love. There’s a joy in that. Radnor: There is a joy in that. If I hear a piece of music or even get a quote that is inspiring to me, there’s like 12 people I immediately want to share that with. You’ve made a whole life of that [laughs]. Paste: What are you working on now? Where is your art taking you? Radnor: While I was filming in Wisconsin, I wrote a play called Sacred Valley that I’m doing some readings and workshops on that I’m hoping to get staged at some point. I’m very excited about that. I have a movie I rewrote for a studio that we’re working on getting cast right now that I have to be a little quiet about because it’s not officially on the books yet, but it’ll be a bigger movie, and that’s really exciting. I have another movie that’s set in Poland that I’m hoping to shoot next year. I’m just trying to find a window for it since I’ve been doing so much acting. I’m about to go to Richmond and do another season of Mercy Street, which is why I have a glorious 19th century beard. And I’m writing a book of essays, musings from the road. The Seeker is currently playing film festivals across the country.